“Our efforts to further increase efficiency start with fuel injection systems and continue on through consistently, all the way to exhaust gas treatment,” says Dr. Markus Heyn, president of the Diesel Systems division at Bosch. At the heart of these efforts lies Bosch’s integrated approach. It ensures that powertrain systems and subsystems are reliably and perfectly harmonized. 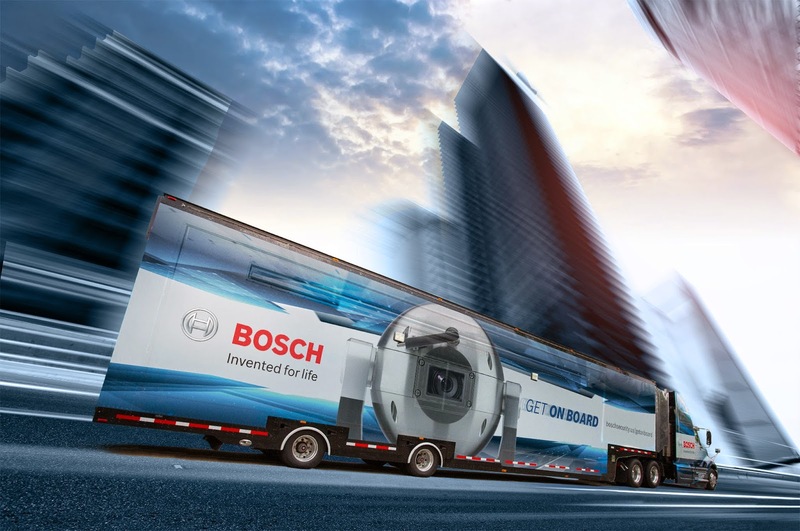 Advanced Bosch powertrain solutions enable commercial vehicle operators to lower their operating costs. Even though modern truck diesel engines already work at close to the thermodynamic optimum, Bosch’s innovations enhance powertrain system efficiency even further. The decisive factors here are developments on the micro level, such as the new CRIN3-25 injector, which prevents fuel from ending up unused in the return line. As a result, the new Bosch common-rail system can achieve fuel savings of up to 1 percent. Truck operating costs also depend on the amount of Diesel Emission Fluid (DEF) that is required to scrub oxides of nitrogen from exhaust emissions. The Bosch Denoxtronic metering system enhances efficiency by variably matching urea-solution injection to the region of the world where the vehicle is being used. This allows vehicle manufacturers to precisely customize their powertrain design. In regions where DEF is expensive, Bosch can offer a systems approach that is designed to accommodate high pressures and high levels of exhaust gas recirculation. In areas where DEF is less expensive, the Bosch system aims to maximize combustion efficiency with high excess air volumes. In this case, the combined effect of the common-rail system and Denoxtronic can produce diesel fuel savings of up to 5 percent. SCR systems are key to meeting demanding emission standards such as EPA and CARB regardless of the configuration, and the Bosch Denoxtronic urea metering system is the essential part of this solution. As a result of 2010 North American legislation, pollutant emissions from modern truck engines are around 98 percent lower than they were at the end of the 1980s. It would take 60 of the 2010 trucks to equal the same emissions from one pre-1988 truck. Thanks to Bosch’s optimized common-rail system, CO2 emissions also are decreasing. Bosch’s new 2,500 bar system is based on a modular systems approach. Bosch’s CRSN3-25 is leak-free in both low- and high-pressure ranges. Injecting the compressed fuel that has been delivered with as little loss as possible contributes significantly to greater efficiency throughout the powertrain system. Bosch has designed a system that prevents gap leakage through which fuel can escape unused into the return line. It achieves this by subjecting the parts inside the injector, up to and including the control valve, to rail pressure. So that the nozzle needle can open under such conditions, the needle is hydraulically coupled to the push rod. As well as improving efficiency, the ultra-precise, leak-free injector also ensures a cleaner fuel burn, with a corresponding reduction in particulate and other emissions. Additionally, because the system pressure is retained for a long time, vehicle operators also benefit from the excellent restart response this offers in stop-start operation. As the amount of fuel consumed during lean operation goes down, the nitrogen-oxide emissions of an engine typically increase. This conflict of objectives represents a major challenge for commercial vehicle manufacturers. When it comes to making large commercial vehicles compatible with extremely tough emissions standards such as 2010 EPA regulations, the Denoxtronic urea metering system is the ideal component for the exhaust gas system. Because it works without compressed air, it is a system that is as efficient as it is cost-effective. During development, Bosch placed particular emphasis on creating a robust design and compact configuration. Compared with the previous generation, the size of the delivery module in the latest Denoxtronic 6 was reduced by about a third. In addition, the module guarantees a high throughput of DEF without allowing fuel to condense on the walls, increasing efficiency. The avoidance of plastics as much as possible allows the metering module to be used for continuous operation at ambient temperatures of up to 248 degrees Fahrenheit. This robustness gives commercial-vehicle manufacturers more freedom when integrating the component in their exhaust systems. For this purpose, Bosch Emission Systems US (BESU) provides turnkey projects, assuming responsibility for the purchasing as well as for the definition and integration of all components for exhaust gas treatment. Sensors are essential for powertrains, continuously gathering accurate, up-to-date data from the exhaust system. This data is the basis for all functions, from mixture formation to clean combustion to exhaust gas treatment. Besides the usual sensors for determining the powertrain’s exact operating mode, Bosch also offers NOx sensors for SCR-system monitoring and control, and sensors for monitoring the diesel particulate filter. The new particulate sensor from Bosch is specifically designed for commercial vehicles and for installation in the exhaust emissions box. It is highly sensitive and is therefore able to work reliably even at low exhaust gas flow rates. In addition, the sensitivity can be increased by adjusting the tilt angle during installation. The sensor enables the reliable detection of malfunctions in the diesel particulate filter, and is compatible with the SAE J1939, which is used for communication and diagnostics among vehicle components. The Bosch NOx sensor meets the high standards of reliability that apply in commercial vehicles and is suitable for worldwide use in commercial vehicles, including 12- and 24-volt systems. It can measure high NOx concentrations of up to 3,000 ppm and also features compact control electronics that are able to evaluate even very small sensor streams as well. A special coating makes it very tough, capable of withstanding extreme temperature fluctuations and the accumulation of deposits. This ensures the robustness of the overall system. The particulate matter sensor works best in conjunction with Bosch Departronic. By deliberately injecting diesel into the exhaust gas, this system helps to regenerate particulate filters.